With Mobile World Congress about to kick off in Barcelona, Alcatel has lifted the lid on its new mid-range Idol 2 series. First up is the One Touch Idol 2, a mid-range smartphone that sports a 5-inch HD LCD display and is powered by a 1.2GHz quad-core processor alongside 1GB of RAM. It runs Android 4.3 Jelly Bean out-of-the-box and is slated to get an Android 4.4 KitKat update later this year. It also features an 8-megapixel rear camera, a 1.3-megapixel front-facing camera including Wi-Fi, Bluetooth, NFC and 3G connectivity. Meanwhile the Alcatel One Touch Idol 2 Mini features a 4.5-inch HD display and runs Android 4.3 Jelly Bean that will also be upgradeable to Android 4.4. The One Touch Idol 2 Mini packs identical specifications to its elder sibling except that the Idol 2 Mini sports a better 2-megapixel front-facing camera. Alcatel also revealed the One Touch Pop Fit, a wearable smartphone with a colourful plastic shell that houses a 2.8-inch screen along with some low-end specs. It comes bundled with accessories including an armband in which the smartphone attaches, so you can travel with it whilst doing exercise. 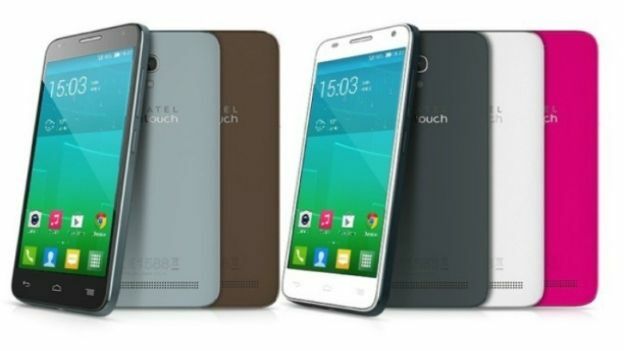 The Alcatel One Touch Pop Fit goes on sale in May retailing at just £73. The Alcatel One Touch Idol 2 costs £165 whilst the One Touch Idol 2 Mini costs £140 with the whole range going on sale in the next few months in Europe, the US and China. Stay tuned as Mobile World Congress kicks off in Barcelona tomorrow with T3 on hand to report on the latest smartphones from around the globe.